Remember how, on the incredible final day of the 2011 regular season, the Orioles rallied to beat the Red Sox, helping keep them out of a playoff spot. Remember the wild celebration on the field after that final game at Camden Yards, by a team that finished the season 69-93? It's something of a cliché, but that game was the Orioles' World Series last season, except instead of celebrating a championship of their own, they celebrated the fact that they'd helped dash the title hopes of a divisional rival, just as Tampa Bay was completing an incredible comeback at Tropicana Field to secure the A.L. 's Wild Card berth. And so this week, those four teams are squaring off, and once again, three of the four have dreams of a postseason run. This time, though, it's the Red Sox looking to play spoiler — and last night, they did. Of course, last night's loss stings all the more for the Yankees because in recent weeks, the Red Sox had been doing a terrible job of playing spoiler. A couple of weeks back, they lost six straight games to the Angels and A's, both of whom are in the playoff hunt. 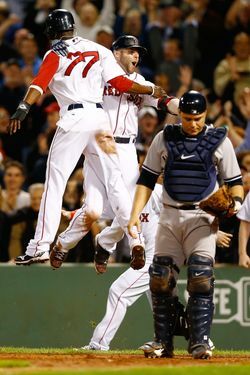 They were also swept by the Angels earlier in August, right after losing consecutive series to the Orioles and Yankees. They'd lost eleven of twelve overall entering last night's game. And yes, last night's starter, Jon Lester, had been pitching okay over his last five starts (4-1, 3.44 ERA), but the Yankees had the reliable Kuroda on the mound last night. It's the kind of close game the Yankees can't afford to lose, and thanks to Baltimore's rout of the Rays last night, they're once again in a tie for first in the American League East. David Phelps starts tonight against Aaron Cook in Boston, while Miguel Gonzalez pitches for Baltimore against Tampa Bay's Alex Cobb at Camden Yards.